Cortec is a nationally recognized leader providing toroidal power solutions. At Cortec we design, manufacture and ship to meet your unique needs. Using proprietary manufacturing processes, Cortec has gained a reputation that separates us from other core winding vendors. 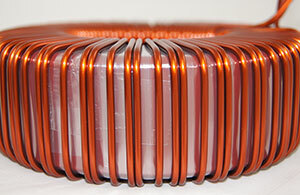 We can supply your company with a variety of toroidal power products. 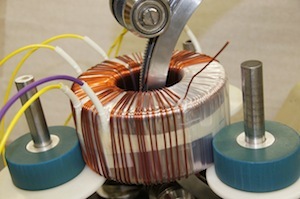 Large or small, whether you need toroidal power transformers, toroidal inductors, or custom toroidal applications, we have a solution for you. We work on toroids from 5VA to 10KVA. 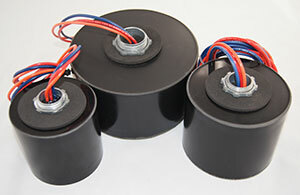 Our comprehensive engineering staff specializes in electrical and toroidal magnetics design. Our highly-skilled employees are recognized in the toroid industry for innovation, responsiveness and flexibility. Together with our custom fixturing, we can quickly and inexpensively adapt tooling for custom applications. Simply tell us the application and what you want the product to do, and we can provide you with a working sample. Cortec maintains relationships with industry leaders to assure continual development of the latest toroidal technology and manufacturing techniques. We utilize all-programmable, state-of-the art manufacturing equipment and proprietary manufacturing methods to help you quickly get your product to market. All products are 100% electrical tested before they go out the door. We are a total solutions provider with value-added manufacturing capabilities. Learn more about our capabilities. Cortec succeeded after one try whereas others, after one year, still couldn’t get it right. We traveled around the world trying to find someone to wind a complex toroid. We found that capability at Cortec. We sent our engineer on site at 8 AM and by 8 PM we had a working sample of a very complex segment wind. Cortec dedicated an operator and machine, as well as special fixturing support, as we developed. I can’t possibly put into words the heartfelt gratitude I have for the often-times incredible, if not miraculous, support you provided over time, always at a high level. You have made my job much more manageable, and our company is better because of your efforts. Many thanks!